Two weeks ago, experts announced an historic heatwave in Arizona. They said that “Lying About Science For Politics Is Evil” – which is exactly what they are doing. In fact, June has been just about average and much cooler than 1896. 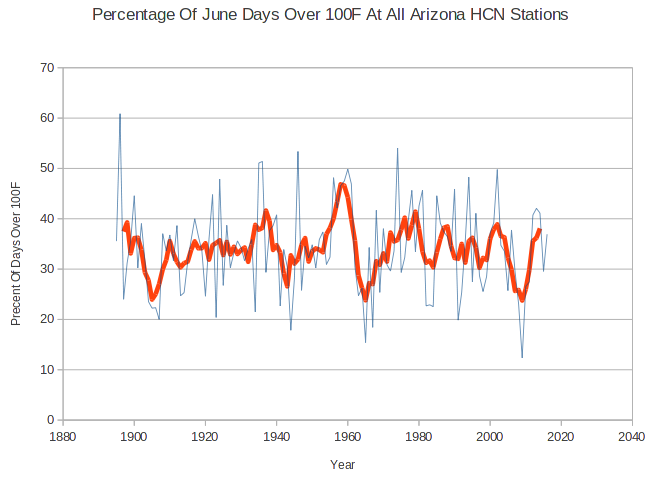 The June heatwave of 1896 was much hotter and longer than this year’s two day spike. This year’s heatwave was just about average, and nowhere near a record. With climate experts, it is all lies, all the time. And then they accuse the honest people of being liars. Monsoonal moisture is flowing into the southwest and temp in my area are dropping by 15 degrees. It has to get hot for the differential to set up between the ocean and the land for the moisture flow to change. Well I’m glad the heat wave there is over. Just got the call. Team run leaving out tomorrow morning for Nogales, AZ. 3,600 mi round trip. Deliver there Friday morning and pick up there early Friday afternoon. Should be back home by Saturday afternoon if everything goes right. At least they aren’t totally screwing up my 4th of July weekend plans. How can Satan cast out Satan ??? I’ve been running my temperature logger in my covered patio in Tempe, Arizona and the I can tell you the “Historic Deadly Heatwave” didn’t amount to much considering Historic Temperature data for this area. 3. KPHX is at the Phoenix airport – I consistently read a bit higher – could be logger uncertainty; could be Tempe is a little hotter than Phoenix; could be how I have the logger situated. Bottom line: It tracks Phoenix; and it’s pretty close. 4. 06-20 was the day I set it up – but 06-19 was also hot. 06-20 was a record breaker, but just barely, and further more, the record isn’t anything special for this time of year. Just look at the record for 06-26 at 122 deg F. Yes. It gets really hot out here sometimes. Oh, and by 06-26-2016 we were already a whopping 16 degrees F below the record; and exactly at the longer-term average. 5. 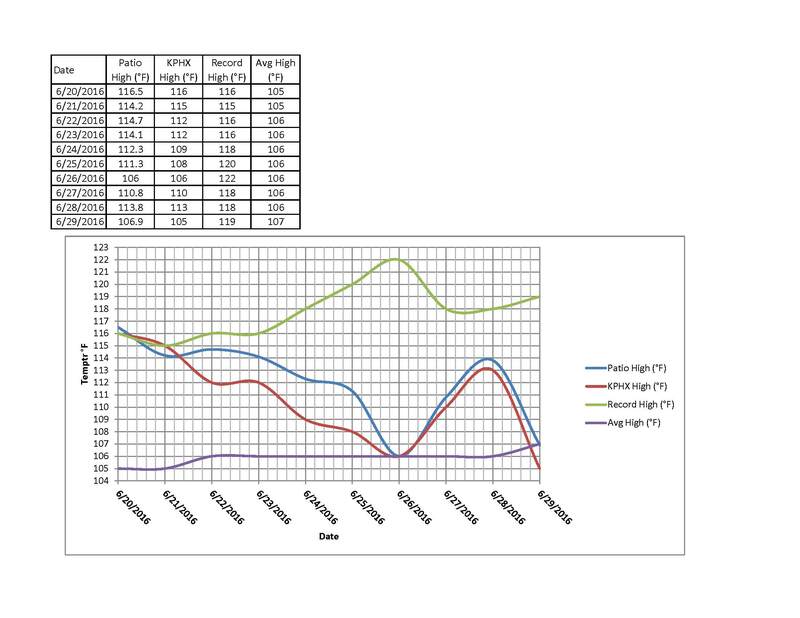 Not shown at this scale, but something I’m working on is the quality of the heat distribution throughout the day. Some days, it gets about to the max by say 3:00 in the afternoon and hangs there until 6:00 or so. Freaking hot day when it’s like that. But sometimes, it just peaks at a high and immediately backs off. Regardless of the high, this is a “cooler” day. 06-20 was not only hot, but stayed hot for several hours. After that, the heat-trend has been one of a peak shape; so 114 might not sound like it is much cooler than 116, but the 114 days after 6-20 were “peak” not “hang” days so it has felt much cooler.